Refractive Therapy, we would be able to correct your shortsightedness and improve your vision without having to wear spectacles/eyeglasses or contact lenses during the day. Plus, it able to reconsider having your eyes undergo LASIK or any other type of eye surgery. Interesting huh? Yes. It’s here now at Malaya Optical in Damansara Uptown or Subang SS15. We have been practicing this for many year starting with Ortho – K base material, now we are using the latest Corneal Refractive Therapy from USA. This is a non surgical procedure that uses the state of the art contact lenses to reshape the corneal during the night. Yes. You will just be sleeping with these at night, the next day, it would clear vision just as with your glasses/contact lenses but without them on ! Plus, Ortho-K is one of the most successful method to reduce the rate of Myopia (shortsightedness) increase currently for children. WHO IS A CANDIDATE FOR CORNEA REFRACTIVE THERAPY, CRT (ORTHO-K)? Atheletes, Pilot, Cook, Divers, Off Shore Workers, Race Car Drivers or Individuals who occupation requires improvement in vision without spectacles or contact lenses. BEST Method to reduce progression of myopia (shortsightedness) within children. Our cornea is the outermost transparent layer of the eye and functions as a light focusing mechanism for the eye to achieve clear vision. In the case of shortsightedness, it’s either the cornea possesses a steep curvature or the eye ball had elongated excessively, hence causing light to falsely focused in the eye. With Corneal Refractive Therapy (Ortho-K), the eye surface is gently reshaped by a specialized contact lens during night while you are asleep. The eye surface is then reshaped to a desired curvature that is clinically deemed suitable to correct the shortsightedness in the eye. After the eye surface is reshaped, you will be able to see clearly with your natural vision! Even after you remove the specialized contact lens when you wake up the next day! 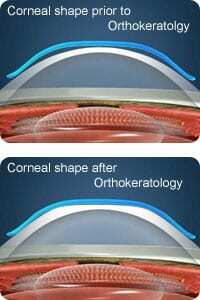 However, Ortho-K’s effect on reshaping the eye surface and correcting power is temporary. The effect of the reshaped eye surface and corrected vision works best during day time of the waking hours, and might be slightly affected in the end of the day. Wearer will need to wear the specialized contact lens continuously on a prescribed schedule to maintain the reshaped eye surface and corrected vision. Only works best in candidates with shortsighted less than -5.00 DS and astigmatism less than -1.50 DC. Does not effectively work on certain eye surface condition, due to the complexity and rigidity of eye surface. Contraindicated with individual who had eye allergy, inflammation or history of certain eye diseases. Q1: It seems that there are so many methods alike to control myopia, such as RGP or Ortho-K and CRT. What’s the difference between them?A: RGP is short name for Rigid Gas Permeable Contact Lens, which is contrary to SCL (soft contact lens). For the day wear RGP, there are several brands: Menicon, Boston and etc. There are some RGP for the overnight wear ones, there are EUCLID and E&E, etc. You can also call the night wear RGP Ortho-K. It’s some kind of corneal reshaping technique (CRT). Q2: Some clinics use trial Ortho-K, others don’t. What’s the difference between them? Which is better? A: There are two main methods in the world to prescribe the right Ortho-K: standard trial Ortho-K assessment and digital corneal topography simulation. Both methods have their own advantages and drawbacks. For the first method, the procedure is quite detailed. The result is of good predictability and has a success rate of 90%. But it’s time consuming. It will take you about 2h to assess the trial lens effect and undertake some examinations. While for the second method, you can get your prescription according to your own corneal topography directly. It’s quite easy and quick. at Malaya Optical, we have the Corneal Topography by Carl Zeiss which can help improve success rate. The success rate is quite high, about 95%. Q3: What examinations should be done before prescribing the Ortho-K? A: The basic three examinations are corneal curvature, corneal topography and subjective refraction. If you want to get better result, intraocular pressure are recommended. If you want to evaluate your corneal health condition and myopia progress, corneal endothelial cell number in other words, the whole examinations needed to get your best prescription are corneal curvature, corneal topography, subjective refraction and intraocular pressure. These instruments cost about 250K, which we pride our self to have them. Q4: How long does each pair of lens last? Is it necessary to stop using them before exchanging or detailed examinations? A: Generally speaking, each pair of Ortho-K can be used for 2 years as long as your eye strength progressed not too much in these 2 years and remains under the control of the lens. From our experience, most children can wear them for 2 years. If you want to exchange them after 2 years, you’d better stopping wearing them for at least 4 weeks to let the cornea recover to the original state. Then your biometry can be guaranteed for the right prescription. If you can own good visual acuity with your previous Ortho-K, your new lens can be ordered with previous prescription as long as your axial length did not increase in the last 2 years and it is not necessary to stop using the lens. Q5: How many brands of Ortho-K are there now? What’s the difference of them? A: The experienced Optometrist in Malaya Optical can recommend and suggest to you. Q6: Why can I have clear vision without glasses at daytime after wearing Ortho-K? A: The Ortho-K is of special reverse geometric design. This special design can flatten the corneal central area. As we all know, the glasses for myopia is of concave design. The central area is thin, while the periphery is thick. With the special design of Ortho-K, it reshapes the cornea, just like wearing glasses. This can be maintained for a whole day. The pressure angle and depth are derived from delicate calculation, which is made to coincide with the eye strength. So the child can reach the visual acuity when wearing glasses. However, the flattened cornea will slowly recover to its original shape. If you want to keep the clear vision, you must keep wearing it every night. Q7: What should I do if my visual acuity could not reach 20/20 at daytime after wearing Ortho-K? A: Ortho-K is designed to compensate the child’s whole eye strength. But there will be some difference between theoretical calculation and actual result. If your eye strength or/and astigmatism is/are very high, or your eyelid is too loose or tight, the lens will be decentered, which will cause poor vision during the day. However, it’s not daytime vision but that the children’s myopia controlling effect after many years that determines the final effect of Ortho-K. As long as you can have the visual acuity for classes and normal daily life, the result can be accepted. 60-70% children can get or exceed visual acuity of 20/20 after wearing Ortho-K. However, the others can not. But it is also a success if your eye strength does not progress years later. Q8: What if Ortho-K got decentered? A: Decentration is one of the common complications. This can be divided into two conditions. 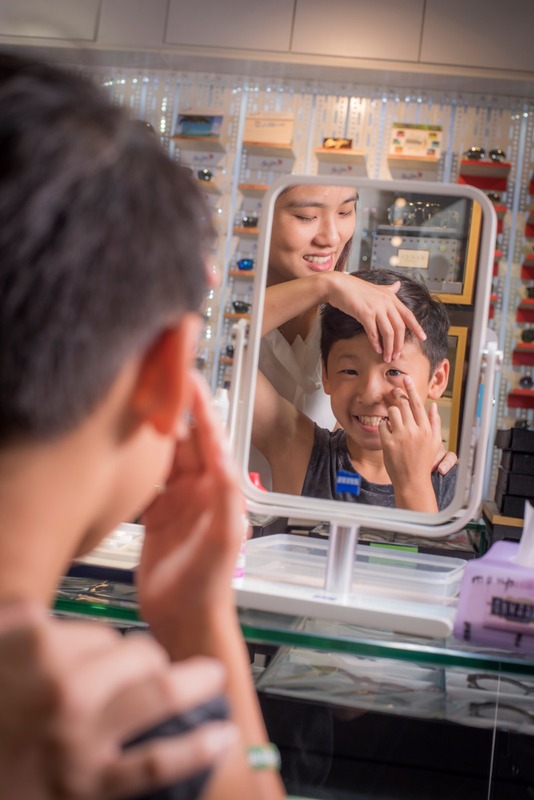 For the first condition, the lens can get decentered right after you put on the trial lens on. It’s closely related to high eye strength, big astigmatism, tight or loose eyelid, or inappropriate lenses. This can be adjusted. You will be informed in advance. Our optometrist at Malaya Optical will talk with you to get the right plan. However, the second condition seems quite troublesome. It’s long term decentration. Everything is Ok at beginning. But weeks or months later, the lens gets decentered. This is attributed to the corneal shape changing and imbalance of the lens, cornea and eyelid. It’s hard to correct the long term decentration. As long as this decentration does not affect your day time vision, it’s OK for you to continue using Ortho-K. But once the vision becomes very bad, it’s wise to stop using it or change a new set. Q9: Will Ortho-K become more and more tighten after long time using? A: Ortho-K will be closely attached to your cornea because of its reverse geometric design and fluid dynamics of the tears in your eye. Just like two pieces of glasses will stick with each other closely if there is water in between. It will cause you a little trouble when you try to take the lens off in the morning. But if you put some solution into your eye and move the lens slightly by your finger, it will be quite easy. Nevertheless, the longer you wear it, the more tighten it will become as the shape of cornea fits the lens better. Parents complain about this quite often, but this is a common situation. Q10: What to do for the maintenance of Ortho-K? A: 1) It will be much better if you can rinse the contact lens solution away by fresh normal saline before you put them on. If there’s no normal saline, you can use cold boiled water, purified water or mineral water. 2) Ortho-K is very fragile. Keep it away from finger nail and other hard objects. 3) Pay attention to hygiene condition of the container. It is recommended to use a new one every three months. 4) The lens should be deproteinized and disinfected in time. Boston contact lens solution is suggested for deproteinization. However, avoid immersing the lens in the solution for too long. Half an hour is suggested. Q11: Questions about any pain, itching, and foreign body sensation after wearing the lens. A: The design of Ortho-K leaves some space between the lens and cornea. You may feel uncomfortable for a while either when you put them on or take them off. You may feel a little sharp pain or tearing. If it happens when wearing it, you can probably get relieved after taking off the lenses and washing them. If you feel mild pain after taking off them in the morning, please wait for while, it will disappear in half an hour. Don’t be too nervous. It’s normal if this happens occasionally. But if it happens every day, you should consult the Optometrist and let the Optometrist decide how to deal with that. Q12: Corneal damage – superficial punctate keratitis (SPK) after wearing Ortho-K? A: This is also a common problem after using Ortho-K. First, most cases are just of mild clinical menifestation. It’s not necessary to worry about it because epithelium – the first corneal out layer is regenerative. The regenerative period is only about 1 or 2 weeks. It protects the cornea all the time. Most people will suffer SPK to some degree after wearing contact lens. However, few of them feel uncomfortable unless SPK is severe. They may feel foreign body sensation or mild pain in the eye. It’s the same condition for Ortho-K. SPK might be caused by the shortage of tear exchange at night or the scratch when you take off them. You just suffer a little red eye or tearing.What to know more? Questions? Drop us a line, we would be glad to answer them.